Good ol' Mom and Dad. Many of us can remember our parents complaining that money didn't grow on trees and grumbling over wasted money every time we left a light on or took too long in the shower. As our parents get older, however, roles and responsibilities start to switch. Eventually, a time comes when we have to have the talk about money with our parents. Sharing financial advice with your parents can be challenging and uncomfortable, but it is an essential talk to have. 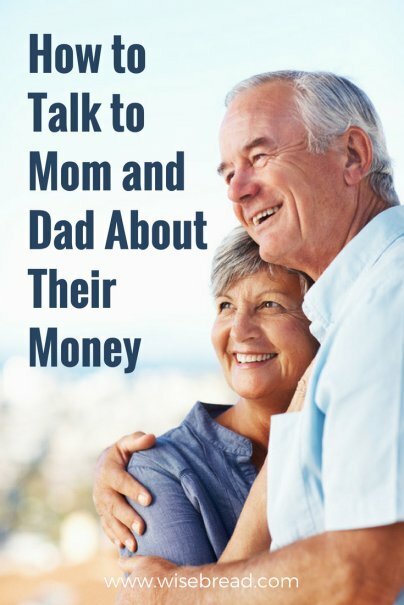 Here's how you can go about discussing money with your aging parents in both a respectful and productive way. If you start a conversation with your parents saying something like, "You don't have enough saved for retirement — what are you going to do?" they are going to be quick to put up a wall. From your perspective, it might seem like your parents have been careless with finances, but there is a chance that you don't know the whole story. Instead, approach them on mutual grounds. Instead of being accusatory, invite discussion. Start off the conversation with something like, "I would love to discuss what you would you want me to do if there comes a time that I need to be your full-time caregiver," or, "I know you mentioned that you wanted to set aside money for your grandkids' education, and I would love to know more about it so that it is done in a way that the kids aren't penalized if they need to apply for financial aid later on." Ask Mom and Dad if there is anything you can do to help lighten their load. They might need someone to teach them how to access their bank info online, do their taxes, or help them prepare a will. Sometimes parents feel embarrassed about asking their kids to take over financially, and may not be ready to hand over the reins right away. You can still extend the invitation by saying something like, "If there ever comes a time where you don't want to deal with budgeting/paying bills/etc., let me know and I will gladly help out as much as possible." Financial information for each bank, investment, retirement, and debt account. All insurance information, including health, long-term care, and life insurance. Estate planning documents such as will, trust, and power of attorney. Real estate papers, such as deed and title. Contact information for all financial advisers, accountants, lawyers, etc. Don't expect to conquer your parents' financial future in one go. Depending on how complicated their finances are, it might take several talks and several prompts of encouragement to get things on the right track. If possible, have other siblings get involved in these financial conversations. Show siblings that if they keep borrowing money from Mom and Dad, they will drain them of essential money needed to pay for health care and living expenses down the road.